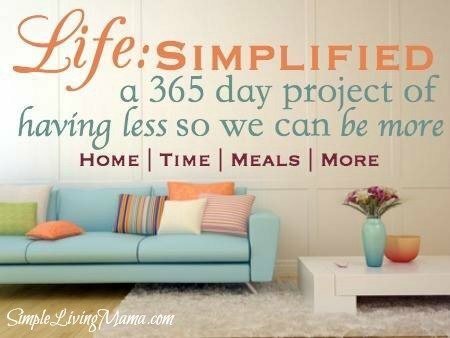 I’m making a little progress on the Life: Simplified Project. 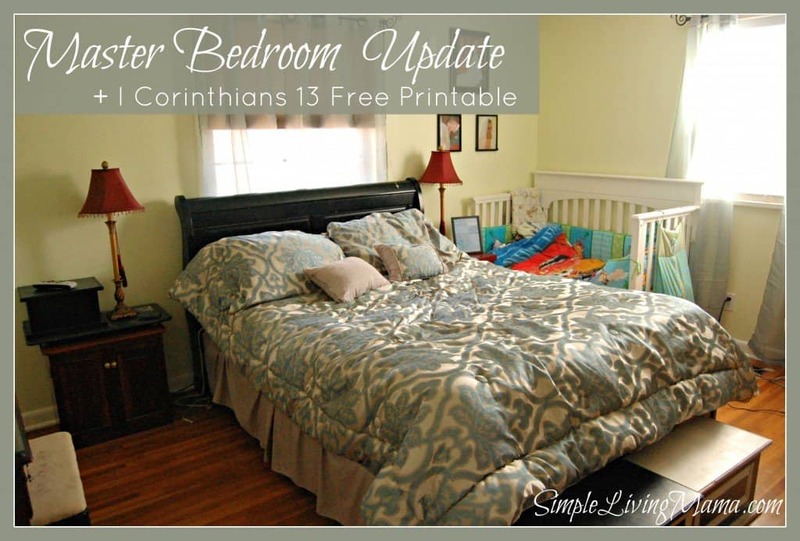 This past weekend my husband and I decided to do a master bedroom update. We went through all of our clothes and got rid of the junky stuff and gave away stuff that we no longer wear, so that freed up a bunch of space in our closet and wardrobe. Now, you will note I am not an interior designer. This room is a reflection of the things we like. We are parents of young kids and our toddler’s bed is still in our room. We have a mish-mash of furniture that we combined when we got married. It works for us! 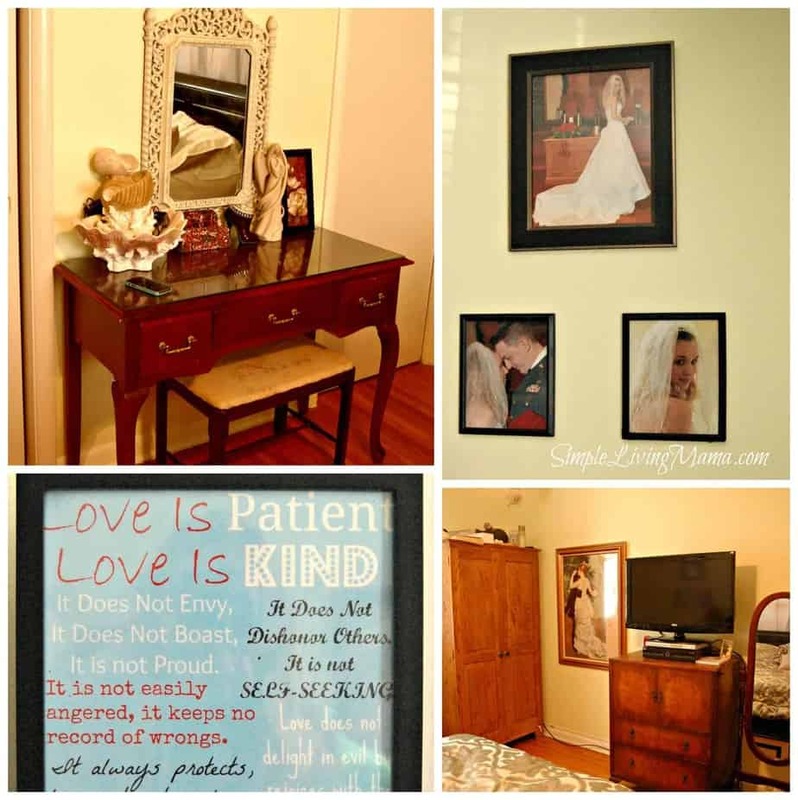 Let me tell you what we did to update, personalize, and simplify our room. The master bedroom can be a catch-all. Clean it up! Put all the papers and things that collect there that don’t belong and put them away! Those work papers do not belong in your bedroom! If you have a desk in your bedroom and no office space, keep your desk clear when you aren’t working. My husband and I go through all of our clothing and declutter regularly. There is no point in keeping worn-out, holy things or clothes that do not fit. We get rid of a lot of stuff and donate everything that is still useable. We bought a new comforter set in colors that we like, and we got new sheets! We haven’t bought new sheets since we got married, so they were much needed. We also got some sheer curtains because our windows were naked. I convinced my husband to hang some of our wedding pictures in our room. I love them! I have a vanity area where I sit to put on make-up. I have always wanted this, so I was glad to finally have the space for it! Along with personal photographs you can add some of your favorite artwork. I have a giant art print hanging in our bedroom as well as a few sentimental knick-knacks gathered around. Put a vase of flowers in your room, or some lovely scented candles. Make it pretty. Make it fancy. Make it YOU! 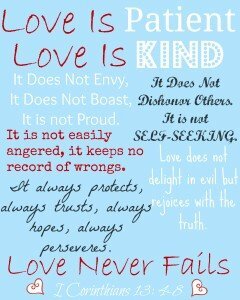 I made a printable of I Corinthians 13: 4-8 and it’s available in my shop. These verses were said at our wedding, so they are sentimental. I made the printable in the colors of our bedroom. I printed mine as an 8×10. I love your sheets! looovee! So pretty! I really need to get around to fixing up our bedroom, too. Thank you for the inspiration! Thank you, Yuliya! It is so much fun once you start putting a room together! I’ve heard it said some couples have Early American furniture – We have early marriage furniture : ) We actually have garage sale, craigslist, auction and some custom built (custom in that our friends built it. It’s purpose is to outlast our youngest 3 boys, not look pretty!) Simple is better. I am working on it. Thanks for the tips. Yes! That is what we have, too! Early marriage furniture! Thanks for stopping by, Machelle! Your room turned out so lovely. I bet your favorite look of it is the wedding pictures, huh? Well, they would be mine. Thank you for the Love is… printable. I need to read this every day. Yes, Julie, I love the wedding pictures! I even want to add a few more around the room! You give some great tips – especially the desk thing…my desk seems to keep getting covered up in the laundry and that’s no good for anyone! We’ve been married almost 12 yrs and our furniture is a mish-mash too. A lot of it was given to us over the years, but hey, it works for us! Congrats and good job! I love your updates. My husband and I recently bought a new bed set and sheets and it makes such a difference. I actually want to make the bed now! We need to do better at de-cluttering, but we are getting there. Nice job making the room your own. Jessica recently posted…#runCLE Giveaway Winner! I really liked your ideas here! Our master bedroom becomes a catch-all sometimes as well, so it was nice to get some practical ideas for changing that. And I appreciate the printable–that’s great! Lisa recently posted…Boost Your Blog! New sheets! What a luxury! Isn’t it funny how easily we dismiss needs like new sheets for ourselves when there are little people around to provide for? I really like the print you made, too! Enjoy your “new” room! Yes, new sheets are such a luxury! I just recently started doing the master bedroom at our house too. We cleaned it up, got rid of the junk, added a fresh coat of paint and a new floor etc. I’m still working on it and doing it on a very tight budget but it is coming together nicely. It’s not fancy but it’s fresh and clean and comfortable. Dropping by from the BYB challenge. It feels good to tie a room together and get all the clutter out! Love your goal to simplify in 2014. I share it! Beautiful printable of a favorite Scripture as well.